The following is NATO’s allied command operations directive on public affairs. Though unclassified, NATO doctrine and policy documents are not released to the public. a. The need to communicate effectively with a wide range of audiences is not just desirable, it is essential to gain understanding and support for NATO’s operations. Public support for NATO’s missions and tasks follows from public understanding of how the Alliance makes a difference to international peace and security. Public confidence, in turn, is enhanced by NATO’s ability to achieve its mandate in a way that is open, transparent. and consistent with member nation values and expectations. b. Military PA policy in NATO and the nations derives from the higher principles of democracy that includes freedom of expression and of the press. Commanders and Public Affairs Officers (PAOs) are in theory bound by NATO policies to inform the public directly, such as through the Internet or through the media, and by international law not to impede the media or freedom of expression. c. NATO’s adversaries use multiple tools at their disposal to inform and persuade the international community that they have the moral high ground and that NATO does not. They use technology and speed to their advantage, often disregarding truth in the process. This is the public environment in which NATO operational commanders must conduct their missions. In an effects-based approach to operations, enhancing support for the Alliance by maintaining credibility is the effect for the PA function. 1-2. Mission. 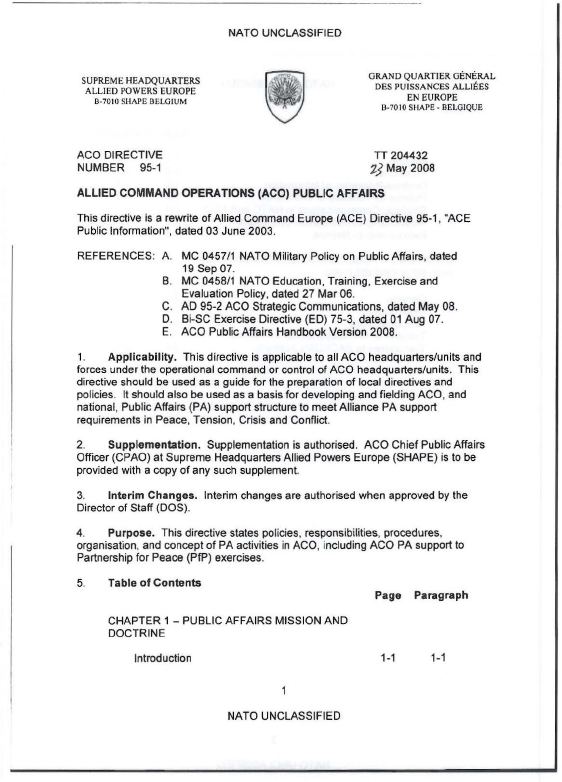 The mission of ACO PA is to support Alliance aims and objectives through truthful, accurate and timely public release of information about the operations and activities of forces assigned to, or under operational command or control of the Supreme Allied Commander Europe (SACEUR) and ACO headquarters (HQ), consistent with NATO and national policies for operational security, and the privacy of forces and personnel involved. a. In concert with other political and military actions, Strategic Communications (StratCom) is used to advance NATO’s aims and operations through the coordinated, appropriate use of Public Diplomacy, PA and Information Operations (Info Ops). This is done at NATO HQ level. b. Within ACO, StratCom takes in all components of the information campaign, but Public Diplomacy and political guidance are the responsibility of NATO HQ. Therefore, at the ACO level, StratCom will be conducted in concert with other military actions and following NATO political guidance, to advance AGO’s aims and operations through the coordinated, appropriate use of PA and Info Ops, in cooperation with the Public Diplomacy Division. In essence, StratCom is the umbrella under which Info Ops and PA reside. c. Within ACO, StratCom will be conducted only at the SHAPE level and not by the subordinate operational commands. a. As outlined in MC 0457/1, PA and Info Ops are separate, but related functions. They directly support military objectives, counter adversary disinformation and deter adversary actions. They both require planning, message development and media analysis, though efforts differ with respect to audience, scope and intent. All military information activities must be closely coordinated with PAin order to ensure consistency in the messages to external audiences and to promote overall effectiveness and credibility of the campaign. Info Ops is a military function to provide advice and coordination of military information activities in order to create desired effects on the will, understanding and capability of adversaries, potential adversaries and other North Atlantic Council (NAC) approved parties in support of Alliance mission objectives. PAis not an Info Ops discipline. While coordination is essential, the lines of authority will remain separate, the PA reporting relationship being direct to the commander. This is to maintain credibility of PA and to avoid creating a media or public perception that PA activities are coordinated by, or are directed by Info Ops. Beyond coordination of efforts, messages, or being informed of these activities, PA will have no role in planning or executing Info Ops, Psy Ops, or deception operations. (1) PA transcends the theatre of operations- PA speaks to theatre, regional, international, and member-nation audiences. (2) PA is conducted continually through the war-peace continuum. (3) PAis targeted at both internal and external audiences. (4) PA is the only function that is mandated to communicate through the news media. (5) Info Ops and Psy Ops seek to influence decision makers or the behaviour of target audiences through careful study and targeting. (6) Using objective words and images, PA seeks to inform broad or target audiences and thus negate the influence of biased or erroneous information. PA may not use deception in its communication. (7) Info Ops and Psy Ops are often applied in a calculated fashion. (8) PA is routinely executed within minutes.